This lemon bergamont refreshing body scrub contains active mineral ingredients from the Dead Sea. 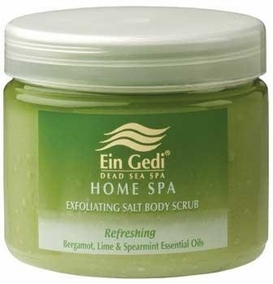 Dead Sea products are legendary in their ability to relax, heal, soften and invigorate the skin. Since ancient times, the mineral mud of this unique geographical site has been recognized for its skin care value. The mineral action also works to tighten the pores, helping skin to look and feel its best. Superfine grains allow for easy application, even coverage and easy removal. Facial mud masques from the Dead Sea come in various strengths of mud and salinity, making them suitable for different skin types including oily, normal and dry skins. Products include Dead Sea cleansers, nourishing creams, moisturizers, foot creams, hand creams, eye make-up remover, skin toners, astringents, face wash, spot treatment, bath and shower gel, stabilizing ampoules, sun protection creams, and soaps. Use this product in the comfort of your own home to treat your skin with all the goodness that the Dead Sea has to offer.